We have a day, that day being Wednesday. We have a car, that car being Andy's green machine. We have a gang, that gang comprising Andy, Ed, and, for the second week running, Kev. We don't as yet have a destination. Running out of lunchtime places? Like tragic Karen, we've only just begun. Yours truly makes a suggestion which is duly accepted. Nearing Woodbridge's very own Wyevale, we ignore the turn-off to Hasketon (that way lies Grange Barn) and instead veer the VW towards confusingly named Hacheston. Where? On the way to Sheeranville if that helps. 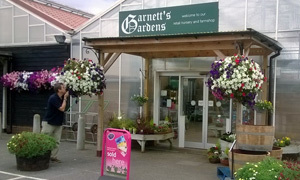 That Parham sign tells us we've arrived: greetings, Garnett's, the none too central garden centre. In on the right, shimmy to the left and crikey, it's coffee corner. Do you order at the counter? Nope. Do you wait to be served? Nein-nein. In a move of which William Woolard would be proud, this is entirely self-service. Snag one of the Barnies prepacked sarnies from the fridge. Add a drink. Pick a plate. Collect some cutlery. Grab a glass. Take a pew at one of the pine tables. Consume. Enjoy staring at the seed packets. Egg mayo & bacon sandwiches for them, pork & onion chutney pork pie for me plus a pack of Corker's onion crisps. They're gonna love me at work this afternoon. Bottles of Fentimans all round. We're not alone, other tables being occupied by coffee-supping ladies and leathered bikers. It's fine. OK, it's a bit weird. Nursery noshing-wise, certainly ain't no Bizzi Beans. Dessert is DIY ditto. Servez-vous with a slice of cake, a choice of coffee or farmer's fruity loaf, and bevvy up courtesy of the FreshMore vending machine. Left spout for coffee, right for tea. Cafe au lait was alright though short of the high standards set by French service station machines. All done, we took our selection of dead wrappers up to the counter and paid the smiling lady. Job's a good 'un. Given that the village shop has forsaken comestibles in favour of pine furniture, Garnett's must come in handy with its fruit, veg, newspapers, cans of food and cordials. And the odd ornamental dog. If it was a car -- Ford Granada Mark III. If they were passing by -- Warren Mitchell.